This volume of the Spitalfields series covers the period from the closure of the medieval priory of St Mary Spital in the 1530s to the 19th centuries and reconnects the archaeological assemblages with documentary evidence in order to describe the early modern suburb, its people and their possessions. From the private mansions and artillery ground of the 16th century to London’s first terraced houses in the 1680s, and on to Spitalfields Market and the silk industry of the 18th and 19th centuries, the household economies and leisure activities of the residents are revealed, notably by the items discarded in their cesspits! 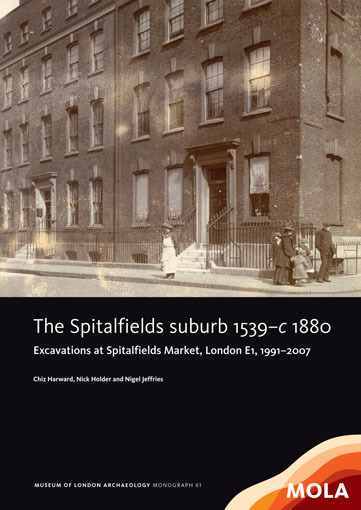 Altogether a rigorous archaeological and historical survey, with many fascinating insights into the growth and development of a less well-known part of Spitalfields. … a series of fascinating insights into the lives of Spitalfields inhabitants and their changing worlds in this vibrant part of London.